We had the pleasure of visiting Japan in October of 2016. Leading up to the trip, I was really looking forward to visiting with Karen because it would be her first real trip there. As most of my friends know, I've always had an affinity for Japan with this time being my third visit and probably even more visits somewhere down the line. There's something about it that really resonates with me and I don't think I'll ever grow old of it. Maybe it's the appreciation for details that I've found their culture to have that brings me back. The effort and appreciation that goes into a cup of filtered coffee. The taste and presentation of a meal at a large fast-food chain. Things like that. I don't know. Perhaps it's not as obvious as I think it is, but it's something I find particularly unique about Japan. They're all pretty mundane things to be honest. I enjoyed it though and I hoped Karen would too. In the images in this essay I really tried to capture what it is that sees me returning to Japan again and again. Having Karen there with me, we visited and documented some of the standard tourist attractions but I think where my images speak the most is in the quieter places where we weren't surrounded by the touring hordes and where we had as much time as we wanted to really observe and see what Japan is really all about. 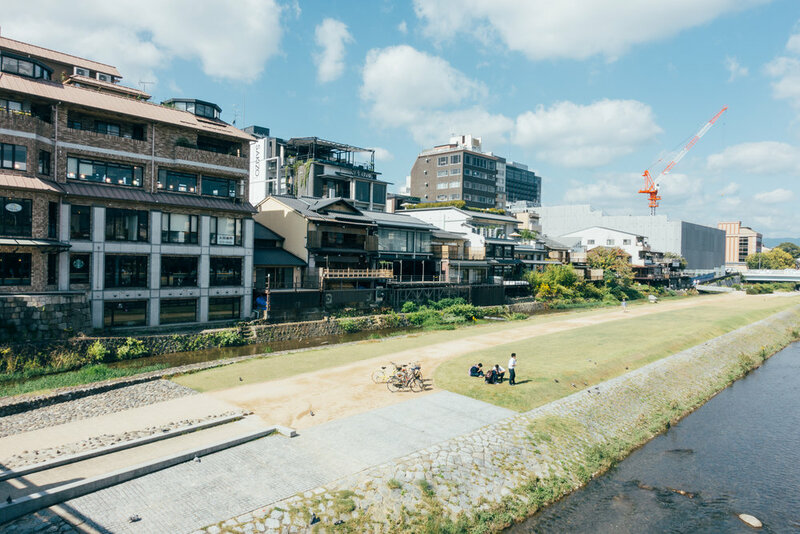 In Kyoto, the Kamo River (鴨川) runs through the city from the north to the south. It runs parallel to Kawaramachi-dori which is one of the busiest major arteries in Kyoto. Pedestrian pathways run along the river and are steps away from the busy streets and commercial areas of the city. It is quite an accurate depiction of Kyoto to have such contrasting scenes within such close proximity to one another. Getting away from the hustle and bustle of the commercial district can be had by heading one block over and going for a peaceful walk by the river. A common sight in Kyoto is that of the bicycle. Everyone bikes. Being gifted with generally flat land, it's not really a wonder. The public transportation system is also quite useful (especially when you're carrying 25lbs of photo gear on you). Most, if not all, of the city is covered by an extensive bus system but is supplemented by an equally useful subway and rail. Bikes are plentiful in Kyoto. The flat landscape of the city and the well maintained roads are probably the major factors in this. 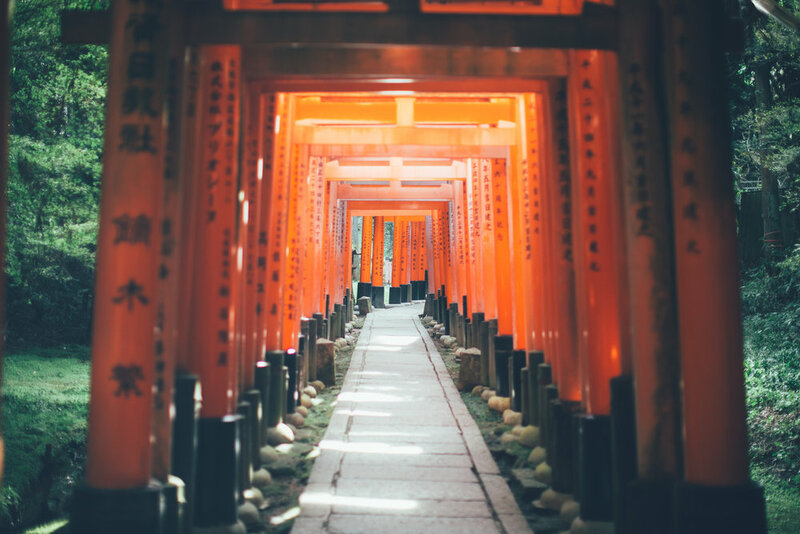 The Fushimi-Inari Shrine is probably one of the three most popular sights in all of Japan. It is a shrine centred around the Fox God of Shinto. Tourism in Japan has been on the rise again in recent years and this shrine along with many others in Kyoto are suffering the consequences of it. Yes, you will experience hordes of tourists all making their way to the shrine with you even though you decided to visit in the non-peak hours (does that even exist anymore?). Yes, you will find it nearly impossible to get a photo without having someone's outstretched arm, leg or face get in the way right as you click the shutter... And yes, you will get first hand experience of "human selfie traffic" as the men, women and children in front of you abruptly put on the brakes and whip out everyone's favourite phone on a stick. All that being said... If you're still with me, this place is not a tourist trap. 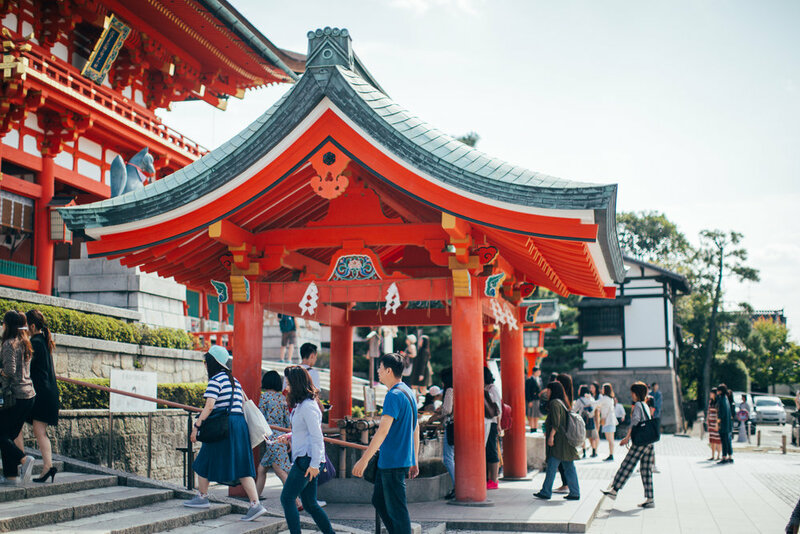 The Fushimi-Inari shrine is situated at the base of a mountain with paths leading up and all around. Fortunately, once you head halfway up or more, the crowds begin to thin out considerably. You'll stop hearing the incessant simulated shutters of smartphone cameras and actually be able to hear the sounds of the natural surroundings. It takes a bit of hard work and effort getting up there and tackling the stairs but it is definitely worth the effort. If and whenever you do make it to this Fox God Shrine, do make sure you see the whole thing because it's absolutely beautiful. The first few steps into the shrine are just the tip of the iceberg... or base of the mountain? Whatever. Make sure you head up more than halfway cause there's a hell of a lot to see. Got off the subway and basically had to wait for everyone to clear off the platform before I could get this shot. The train station is a very short walk to the entrance of the shrine. Unless you're planning on visiting something else in the area, it's basically impossible to get lost because everyone's going to the same place. If anything, with the amount of people that visit this shrine, you could pretty much close your eyes and still end up at the entrance . At the entrance of a very crowded shrine. Rest stops along the path. Ice cream and cold drinks that get more and more expensive the higher you get. Unsurprisingly, aside from the many tori gates, the shrine is rife with statues and figures of foxes. Halfway up and turning around to get a view of Kyoto. Can vaguely make out Kyoto Tower in the distance. A shot that would be nearly impossible at the bottom of the mountain. The shrine gets much more serene and peaceful as you near the top. Exploring and photographing Kyoto is pretty simple. It's a very walkable city and there's pretty much something to shoot around every corner. Tight and narrow streetscapes or vast views from the decks of thousand year old shrines. Japan's pretty photogenic as a whole, but Kyoto's probably at the summit. You'll hear that the old era is carried into the modern age via the traditions and customs of the people and city in Kyoto, but in a simpler way, especially in contrast to Osaka and Tokyo, the buildings and physical embodiments of the old era are probably the most influential carriers. Older buildings and streets are preserved well and are the first layer of bringing back older Japan to the modern world. As cliche as it sounds, Kyoto does a wonderful job of melding the two worlds without feeling like you've sacrificed much to get that dual experience. A bus stop outside the Minamiza Kabuki Theatre on the east side of the Kamo river. East of the river is the Higashiyama area of Kyoto which is where many of the shrines and traditional buildings are found (but obviously not limited to). Wandering the streets of Higashiyama early in the morning to try to avoid the crowds of tourists and school children at the shrines and temples. Inside the main building of Kiyomizu-dera. We got there early, but not early enough as I only had time to take this shot before the crowds started pouring in. Yellow Hats. $^#*ing yellow hats everywhere. Grey suit wasn't with the group but he didn't seem particularly interested in the temple either. Probably a business-man who took the early train in and figured he'd check out the temple anyway. Back to Ponto-cho and these crazy narrow (but immensely photogenic) alleys. Ponto-cho is pretty lively at night with tons of eateries for you to hop around. In particular, most of the restaurants to the right in this photo have patios/platforms that back onto the riverside of the Kamo. Some fine woodworking and carpentry in Japan. Details. We headed to Arashiyama and stopped by % Arabica (map below) for a coffee. Pretty popular spot given the location as it's right by the Katsura river and has a nice view of Arashiyama and the Togetsukyo bridge. Tenryu-ji. We woke up way past the time we planned to and got here with tons of people walking about already. Photographs were kind of difficult to get without anyone walking right in front of my lens... At some point I said $#^* it and started snapping away anyway. A-ha! A moment of silence and calm amongst the less travelled parts of the grounds of the Tenryuji. Finished off our short trip to Arashiyama by heading to Steak Otsuka for lunch. Map is just below with slightly more information. % Arabica is a popular coffee shop that has three locations in Kyoto. There are two in Kyoto proper and another location in the Arashiyama area right by the Katsura river. There's no seating inside (save for a room with an hourly booking fee) but why would you need it with such great outdoor views? Steak Otsuka was awesome. It's a simple, small shop that serves Japanese beef at a decent price. You'll find it near the top on the Tripadvisor rankings so it's not really a hidden secret or anything. It's a great place to grab lunch when you're in Arashiyama. If you're visiting outside of the peak seasons from March to May and November to December, you can make a reservation via their website.